Sessa with their second flybridge boat, the Fly 45, promise ‘the agility of an open boat combined with the versatility of a flybridge’. To achieve this they have opted for a pair of Volvo Penta IPS 600 pods and if their use of IPS on the larger 54 Fly is anything to go by, the new 45 is going to be quite something to drive. The 54 Fly is one of the best handling flybridge IPS boats that we have ever tested so expectations are high for its little sister. Propulsion aside there are plenty of other things to get excited about, not least is Sessa’s radical and cutting edge styling which, in initial pictures at least, seems perfectly judged and a neat combination of the practical and fanciful. The flybridge is claimed to able to seat 8-10 people in comfort whilst there is dedicated space forward of the helm station for sun bathers. Interesting features like the shaded privacy screen across the transom bring some spice to the table but the effectiveness of a device like this remains to be tested. The basic principle of maintaining privacy whilst berthed stern to at a busy Med quayside is a sound one, however. 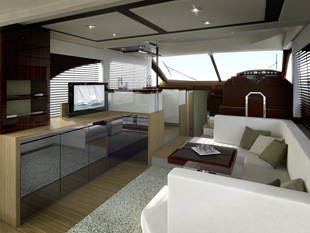 The interior can be had with either two cabins and a galley down layout or three cabins and a galley up layout. The two heads units, one ensuite to the master cabin in the bow and the other ensuite to the starboard guest cabin, both get separate shower stalls. The boat will be launched at the Cannes Boat Show in September.